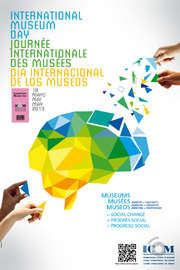 According to the International Museum Day website, it all began with the International Council of Museums (ICOM) in 1977 to “raise awareness on how important museums are in the development of society.” Over 30,000 institutions representing 129 countries participated last year, making it a truly global event. On this day, participating museums interpret an issue that concerns all cultural organisations. International Museum Day is also a fantastic opportunity for museum professionals to meet their public. At the heart of society, museums are institutions dedicated to its development. The richness of our historical heritage, preserved and displayed by museums, together with the inventiveness and vitality that have characterised the museum sector’s action in recent years, are where the strength of museum institutions lies today. Reconciling their traditional mission of conservation with the creativity necessary for their revival and the development of their audiences – this is the evolution that museums are trying to undertake, with the strong belief that their presence and actions can transform society constructively. This truly optimistic theme in the form of an equation dynamically gathers several concepts that are essential to defining what a museum is today, highlighting the universal nature of those institutions and their positive influence on society. It summarises the complexity of museum tasks and recalls that they are meant to contribute to community development and gathering together. I truly admire their encouraging tone towards educational innovation and the ongoing development of the museum as a community hub that can respond creatively to evolving public needs. As arts administrators and advocates, I feel that aligning with social change values is a natural way to connect to our audiences, the improvement of our immediate communities, and to the core of our educational missions. Informal education structures: Museums educate in a recreational way; they are places of initiation without obligation that foster knowledge through continually renewed means. A social space rooted in its territory: Museums play a role in the identity and dynamism of their territory. Through their action, they contribute to promote the past of their territory and build its future. An intergenerational link: Museums keep the relationship between a community and its history alive. They are spaces for dialogue between generations. Displaying heritage in a modern way: Museums have quickly been able to seize the communication and mediation opportunities offered by new media and have broken away from the old-fashioned image they once had. Innovative practices for a better conservation: Conservation devices are improving and the museum is becoming a real laboratory where work techniques continue to evolve.